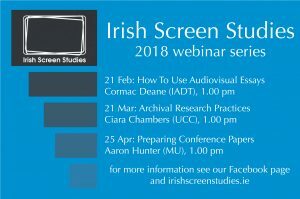 Introducing the 2018 Irish Screen Studies Webinar series. Events will take place on Wednesday afternoons at 1.00 pm (GMT) and last about an hour. All webinars will take place on-line (no need to travel). Follow us on Facebook to find out how to register for the next session. Follow us on Facebook to register (it’s free and open to everyone). The resources mentioned in this webinar can be downloaded here (pdf). 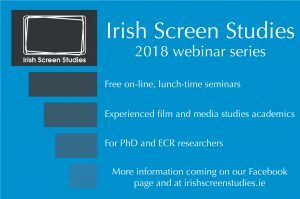 The Irish Screen Studies Webinars are a series of on-line educational events aimed at postgraduate students and early career researchers in any of the various fields of screen studies. Each webinar will take place at 1.00 pm on a Wednesday throughout the academic term. They will be offered by a variety of established academics on a wide range of topics. While the goal of the webinar series is to engage with emerging scholars and broaden the scope of their research and professional knowledge and skills, the webinars are open to anybody who might be interested in the topic. Webinar sessions will be approximately an hour in length. While the content and structure of sessions will vary depending on the topic and presenter, each will include a presentation as well as opportunities for participant feedback and Q&A. Information on the 2018 schedule of topics and presenters is coming soon. We hope to see you there!